Our Stainless Steel Chrome Look Viper BB005 Styling Side Steps are the BEST! The finish is gorgeous hand polished mirror look stainless steel. Easy to fit with tough anodised brackets and strong enough to Stand on. Just look at the photos to see the quality and workmanship in this product! The price includes a pair of Side Steps with 4 Cut-out Plastic Steps for Extra Long Model Vito and Viano that fix to chassis frame mounting points. Our Side Bars and Steps are Hand Polished to a mirror finish. Genuine 76mm Chunky European Quality Stainless Steel. 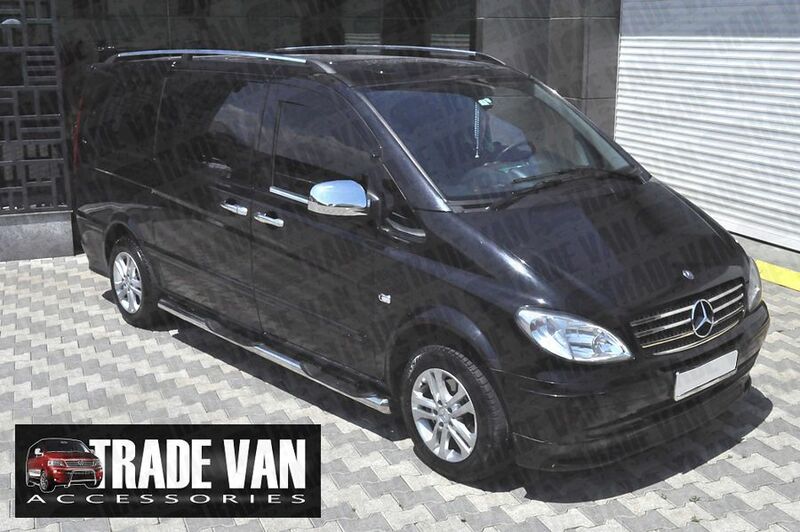 Excellent value for your Vito Van & Viano MPV giving an excellent finishing touch. Would have given 5 stars if it wasn’t for poor delivery. First delivery was missing a bracket and then something happened between them and DPD which meant it took over a week to get replacement bracket. Item looks good and seems of high quality. Overall very pleased. Click the button below to add the Mercedes Vito Side Steps Bars Viano VIPER BB005 76mm EX Long 2004- to your wish list.